Gear Fit is designed ergonomically to fit around your wrist without bulkiness. Its sleek look comes with changeable straps in various colors to match your wardrobe. Further customize your Gear Fit with the variety of backgrounds, wallpapers, and clock designs. Gear Fit not only helps with tracking daily exercise progress, but also keeps you up to date in your busy life by displaying phone notifications directly on your wrist. Receive instant notifications such as incoming calls, emails and SMS, so you don’t have to worry about missing important updates even during your busy moments. Additionally, you can control your music playlist during your workouts directly from your Fit. The Gear Fit is designed to accompany you during your exercise. The light and durable device lets you track your fitness status and motivates you to achieve your goals. Versatile features, such as the Heart Rate Monitor, Pedometer and Exercise allow you to know your workout status easily so you can know how you are performing. Real-time feedback and individualized workout recommendations will help you get in shape. 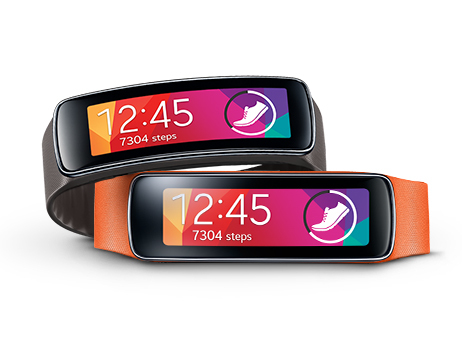 Dimensions 0.92" x 2.26" x 0.47"
To Recieve updates and possible rewards for Samsung Gear Fit please sign in. To Recieve updates and possible rewards for Wearable please sign in.